Bruce Hallihan has ended the speculation for us in today's Daily Gleaner - Ben Wright is returning to the Varsity Reds. 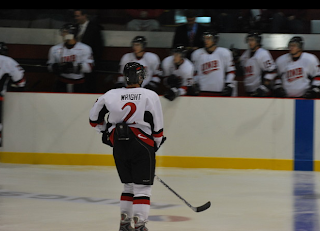 Wright came to UNB and played a few exhibition games for the V-Reds back in September before giving the pros a shot. Prior to UNB, he was team captain for Lethbridge of the WHL, and was a 4th round draft pick of the Columbus Blue Jackets in 2006. He is capable of playing in all situations, demonstrated some offence capability during his WHL career, and brings more leadership to the V-Reds. I'm not sure if there is a 'carded' limit, but the bench can not exceed 20 skaters and 2 goalies for 22. It can go as high as 23 only of the 23rd is the 3rd goalie.